Prototype: Rolling stock from the current passenger service. "metronom" Railroad Company Ltd. bi-level passenger car. Model: 1 bi-level passenger car as an add-on to the 26533 train set. This car is painted and lettered for the current Era V "metronom" design. The car comes with close couplers with guide mechanisms. Length over the buffers 26.2 cm / 10-5/16". Maintenance-free LED's for lighting. Prototype: Privately owned car lettered for the firm Mast-Jägermeister Inc., Wolfenbüttel, Germany. 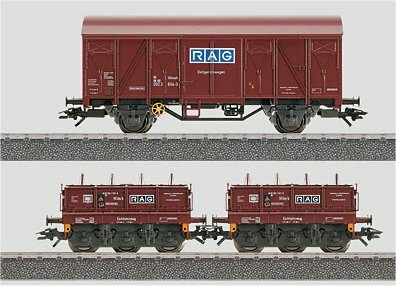 Model: This car has a four-axle freight car frame with close couplers. The car has finely detailed construction with a partially open car floor. The side sills on the car are made of metal. The car can be filled with liquids and has a real glass tank sealed with a cork and installed on a special mount. Length over the buffers 14.3 cm / 5-5/8". Prototype: 2 track scale cars and 1 equipment car lettered for the RAG Railroad and Harbor Company. These cars form a unit for testing track scales. Model: The track scale cars each have a three-axle frame, hinged hatches that can be opened, and 8 removable scale weights. The cars have different car numbers. The boxcar serves as an equipment car for the scales. Total length over the buffers 26.8 cm / 10-9/16". Hinged hatches that can be opened. DC wheel set 4 x 323178, 2 x 700580, 2 x 406240. Prototype: Royal Prussian Railroad Administration (KPEV) class P8. The locomotive looks as the prototype did with a four-axle box-style tender. Model: The locomotive comes with a 5-pole motor. All of the driving wheels are powered. Length over the buffers 90 mm / 3-9/16”. Locomotive for the 100th anniversary of the P8.